The power of the Clow is back with a brand-new adventure! 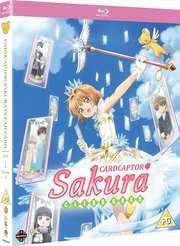 Join Cardcaptor Sakura as she faces a new power, new friends, and reunites with some familiar faces. As Sakura settles into a normal routine, she prepares to face her newest challenge—junior high! While her classes are challenging, things start looking up when Syaoran reappears and says he’ll be staying for good. But when she has a strange dream about a mysterious figure and wakes to find her Clow Cards completely clear, she must return to her duty as Cardcaptor. Ready to take on these cards with a new key and new wand, Sakura will face this mystery with the help of her friends—and seriously cute outfits!